Loretta was raised in an Irish neighborhood in Allentown, Pennsylvania, the granddaughter of four Irish immigrants. Her maternal grandfather was a miner from Leitrim, who was involved with the first unionizing efforts there. In 1983, Loretta met Lewis Glucksman, then head of the investment bank Lehman Brothers, and together between 1987 and 2006, when Lew died at their home near Cobh, they made many unforgettable contributions to Ireland and to the Irish-American community. In 1993, Glucksman Ireland House opened at New York University. Today, Loretta is the co-chair on Ireland House’s advisory board. She is also Chairman Emeritus of The American Ireland Fund. She has played a key role in philanthropic efforts to spread peace throughout Ireland, including funding two integrated schools in the North. 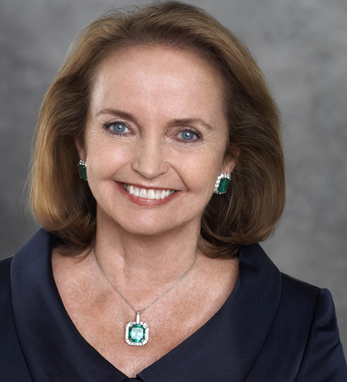 Additionally, Loretta serves as the chairman of the board of the University of Limerick Foundation, is a longtime supporter of FACES (Finding A Cure for Epilepsy and Seizures), which is affiliated with the NYULangone Medical Center.